With incredible reviews at both The Stratford Shakespeare Festival and the La Jolla Playhouse, Jesus Christ Superstar is back on Broadway! Last November, I saw the show at the La Jolla Playhouse and it was spectacular. 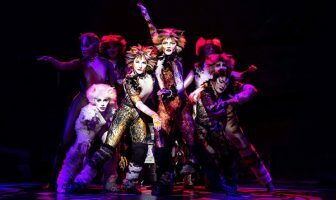 Two-time Tony Award®-winning director Des McAnuff (Jersey Boys, The Who’s Tommy) brings a fresh, new take on the classic Andrew Lloyd Webber and Tim Rice musical. From the minute the lights go down, the show is non-stop; the set and lighting is eye-popping, the actors have phenomenal voices and the the whole experience is an absolute treat. If you’re anywhere near New York, you gotta go see it. 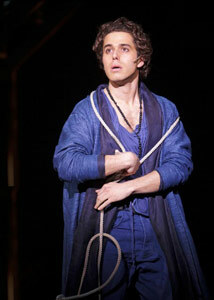 Josh Young makes his Broadway debut as “Judas Iscariot” and he told me he was both nervous and excited. From what I saw, he doesn’t have anything to worry about because he’s great. Besides his stand-out voice, he also manages to make Judas, one of the most reviled characters ever to appear on stage, sympathetic – which is no easy feat. Josh and I talk about the research he did for ‘Judas’, keeping his voice in Broadway shape, a really bad audition for Spider-Man: Turn Off The Dark and how he prepares for auditions. Check out Josh’s website and follow him on Twitter! This is your Broadway debut? Josh Young: It is, yeah. Obviously you’re excited but what’s the one thing that’s happening that you didn’t expect? Josh Young: Oh, nothing. Everything that’s happening is exactly what I expected. I expected to be extremely nervous and paranoid, and excited and jubilant. I expected all of it. You’re nervous and paranoid but you’ve done the show for a while now. Josh Young: Yes,we’ve done the show for a while it’s just we’ve never, I don’t know. I guess I’m a little nervous about the New York audience. We’ve been embraced by everybody else but I know the critics are a little harsher here and the thing is, I can get as nervous as I want but the fact of the matter is, all that we’re going to do is our best work, which is what we’ve been doing all the time. I guess I just kind of think about that and then I just let my nerves kind of go away. 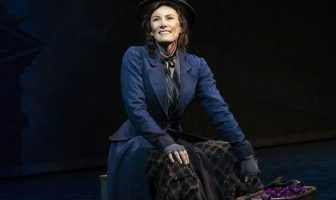 When go from your home theatre and then to La Jolla and now to the Neil Simon, is there anything you have to change with your performance at each theatre? Josh Young: No, the performance stays the same as it was originally in Stratford. The only things that are changing are some technical aspects some of which are really improving the story telling and some were just necessary because of the different dimensions of the stage. Stratford Shakespeare Festival is a repertory company and since you’re already a member, how do you get the role? Do you still have to audition for it? 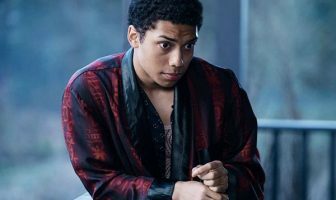 Josh Young: I did have to audition. I’m actually not Canadian. I’m American, I’m from Philadelphia. You’re going to get some Canadian actors pissed. Josh Young: Oh well, what can I do. They all know that and they really embrace me and I’m actually emigrating, so it’s all good. Josh Young: Yes. I’m gonna be a full citizen. My fiancée is in Toronto. I’ve kind of fallen in love with Canada. It’s all good, we’re all friends up there. Anyway, two years ago, the festival couldn’t find Che Guevera in Evita. They were doing Evita and they came down to the States to look for somebody and I got really lucky and I booked it. So, I was doing that for nine months and then they announced that they didn’t have a Judas for the production of the Superstar. I had a suspicion that they were considering me but they asked me to come in and audition and I gave my audition everything cause I love the role and I always wanted to play it and I booked it. How long did you prepare for the audition? Josh Young: I prepared, you know, I can’t remember. Probably, I had a couple weeks up there and it was to sing the opening song, ‘Heaven On Their Minds’ and I approached it as if I had already been cast and what would I do with the song if I were doing the production. It’s pretty darn close to what I’m doing in the show right now. Is that the one song for each show that you just can’t wait to get up on stage and sing? Josh Young: I can’t wait to sing all of them actually. ‘Heaven On Their Minds’, it’s kind of tricky. It’s the most difficult song vocally and it’s the first song in the show, so it’s not like you get to warm up to your 11 o’clock number. You kind of start off with a bang. But I do love the song and it’s an awesome way to open the show. Speaking of that, how do you keep your voice in shape? Josh Young: I generally don’t talk when I’m not on stage. Josh Young: Yeah, I don’t take any risks. There’s too much on the line so anytime I can save my voice, I just do. It’s my Broadway debut. It’s, I think, one of the best productions, I probably shouldn’t even say this, but it’s one of the best productions ever, I think. From just watching the other actors and dancers as well, it’s just the level of excellence is just so high risk not stepping forward to that level. So, I do everything I can. Drinking a ton of water too? Josh Young: Ton of water. I steam during the show. I have a little personal steamer in between songs, And I do vocal warm-ups and vocal warm downs for the show. It’s a very difficult part to sing. With Judas, he’s mostly this reviled character and most of the productions I’ve seen, the show makes him out that way but the way you portray him is also very sympathetic. And I think that’s why I love your performance so much. Was that the goal? How did you accomplish that? Josh Young: That’s the kind of the goal in every role I ever approach, I think, is to make the audience empathize. I don’t want to turn off anybody and I think at least the character that you’re playing needs to think he is doing the right thing and think he is a good guy. I think in this case, I think Judas wants to be a hero and save his people, and also do right by his best friend, Jesus, and just do the right thing overall. Do the right thing by his God and by the Old Testaments. I think he is a very, very religious figure as opposed to some of the New Testament, which makes him out to be possessed by the devil. That’s another thing that I really looked at. If you look out the order in which the books of the New Testament were written from Matthew, Mark, Luke, and John. 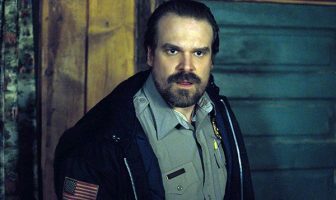 It starts off in Matthew being just a regular guy and then dozen of years down the line, we get to Mark and John and he is actually, they say he has been possessed by the devil. And I think that if we look at what the true story really was, it probably kind of happened in like a ‘Whisper Down The Lane’ fashion, where he probably was just a good guy and then to make the story more interesting. The Gnostics, which were the first sect in Christianity, started passing along the story. They would present the last days of Christ by word of mouth and then one person would tell the story in a different way which changed it and I think it changed in a way to make the story a little more dramatic in the story telling. I think they did that by making Judas into a villain. I think what we’re trying to do is rewind all the way through 2000 years ago to see who this guy really probably was and I hope that’s what I’m doing. Sounds like you did a lot of research for this? Josh Young: Yeah, I did. I did as much as I possibly could. The last role I did was, like I said, it was Che. We presented him unlike they are doing, I know they are doing the revival right now and they are presenting Che as he was in the movie, which is a very every-man approach and not actually the man Che Guevara. But we approached that as Che Guevara and I was able to find everything about his life. He kept a diary so I was able to make that a very autobiographical account but Judas, there is nothing written about who he was prior to meeting Jesus. So all that, I was able to kind of fabricate and make-up who he was in order to make our story more dramatic. I read every account of all the gospels and I read as many as the lost gospels as possible. A lot of them painted a completely different picture than what we know from the canonical gospel that Christianity follows today. So, I took a lot from there as well. And I think it’s really interesting if people wanted to go out and research and read some of these lost gospels. Who’s to say what’s right and wrong. None of us were there but there are other written accounts that aren’t taken into account in Christianity today. You’ve done the show and role for awhile now. Do you still find something new every night or do you think at some point in the run it’s going to become a job? Josh Young: I think because I’m able to create that back story like I said, I’m able to find new things and I’m able to say, “Oh well, if Judas had this occur in his life prior to meeting Jesus that could make the story a little more interesting.” There’s nothing that the audience can see, it’s just things that as an actor I can change up every night and luckily our director loves those little gems that we’re able to find. And I work with actors that say “yes” to everything. They are just the best, our Jesus and Mary, Paul Nolan and Chilina Kennedy, they are two of the best actors I’ve ever worked with and it’s such an honor and pleasure to work with them every night. With your auditions how much time do you put in? Do you just drop everything and concentrate on that? Josh Young: If I really want it. I’ve only had two auditions in the last two years because I’d been a company member at Stratford. Josh Young: Yeah. 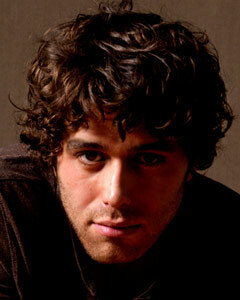 I knew I wanted to play Che and so as soon as I got it, I approached it as if I had already been cast. Researched the role and learned it and practiced it, and dissected every song as if I had already been cast and was about perform the show tomorrow. I know some people will say the opposite of this but for any audition, if I’m able to sing from the show and I can find that material, I will go in and sing from the show and then do it and work on it as if I were already a cast in the show. If they are interested and if you can show them anything that they are interested in then they will try to work with you, and if they have a different idea about the character should be, then at least you’ll have piqued their interest enough I think to have them work with you and hopefully, you’re a directable actor where you can take those notes. But that’s always worked for me, using materials from the show. 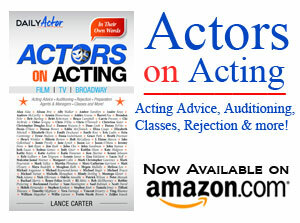 Had you always wanted to be an actor? Josh Young: I think when I was a little kid I wanted to be like a marine biologist or something but as soon as I found out that I was able to make a living doing this, yeah, I’ve always wanted to do it. Josh Young: Well, I had so many. Oh, Spider-Man. It was for Spider-Man. God, it was pretty bad. They had us come in, it was for the role of Peter Parker which was a long time ago. They had us come in and they were actually singing elevation by U2. I don’t know if you’re familiar with the song. Josh Young: Okay, so it starts off with Bono shrieking a bunch of ‘ew’s’, just the word, ‘ew.’ I’m not gonna sing it for you but you can look at it on YouTube. So, there were a bunch of ‘ew’s’ and maybe like 20 ‘ew’s’ before the lyrics start and I had to sing them at the beginning of the audition for the whole creative team. I’m not gonna stand there and sing ‘ew’, so with each ‘ew’, I pretended to shoot the web out of my hand. After the audition, they were just like, “Thank you very much.” I made choice though and I thought that they would really respect that but it was kind of silly at the end of the day. Josh Young: Work harder than everybody else at every aspect of your craft and of the business side. Work harder than everybody else because there’s always going to be somebody working a little bit harder.